Zachary I. "e;Zach"e; Braff (born April 6, 1975) is an American actor, screenwriter, producer, comedian, and director. Braff first became known in 2001 for his role as Dr. John Dorian on the television series Scrubs, for which he was nominated for an Emmy Award and three Golden Globe Awards. In 2004, Braff made his directorial debut with Garden State. Braff returned to his home state New… Jersey to shoot the film, which was produced for $2.5 million. The film made over $35 million at the box office and was praised by critics, leading it to gain a cult following. Braff wrote the film, starred in it, and compiled the soundtrack record. He won numerous awards for his directing work, and also won the Grammy Award for Best Soundtrack Album in 2005. This book is your ultimate resource for Zach Braff. Here you will find the most up-to-date information, photos, and much more. 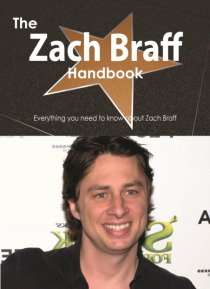 In easy to read chapters, with extensive references and links to get you to know all there is to know about Zach Braff's Early life, Career and Personal life right away. A quick look inside: Zach Braff, Chicago Film Critics Association Awards 2004, Clone High, Columbia High School (New Jersey), Cougar Town, Donald Faison, Duke of York's Theatre, Empire Award for Best Newcomer, Garden State (film), Garden State (soundtrack), Gary Gilbert, It's a Very Merry Muppet Christmas Movie, J.D. (Scrubs), Joshua Braff, Joshua Radin, Kingdom Hearts II, Lauryn Hill, Lazlo Bane, MTV Movie Award for Best Breakthrough Performance, MTV Movie Award for Best Kiss, Manhattan Murder Mystery, My Way Home, Natalie Portman, Northwestern University, Online Film Critics Society Award for Best Breakthrough Filmmaker, Paul Weitz (filmmaker), Primetime Emmy Award for Outstanding Lead Actor in a Comedy Series, Punk'd, Scrubs: Interns, Scrubs (TV series), Scrubs (season 9), Second Stage Theatre, Stagedoor Manor, Superman (Lazlo Bane song)and more pages!Contains selected content from the highest rated entries, typeset, printed and shipped, combining the advantages of up-to-date and in-depth knowledge with the convenience of printed books. A portion of the proceeds of each book will be donated to the Wikimedia Foundation to support their mission.